In large bowl, beat pudding mix and whipping cream with whisk 2 minutes. Let stand 3 minutes. Beat in 1/4 cup Key lime juice and the food colour; stir in icing sugar until smooth. Cover and refrigerate. Heat oven to 350ºF (325ºF for dark or nonstick pans). Place paper baking cup in each of 24 regular-size muffin cups. Make cake batter as directed on box. Spoon about 1 rounded tablespoonful batter into each muffin cup, using about half of the batter. (Muffin cups will be about one-third full.) Refrigerate remaining batter. Bake 11 to 15 minutes (14 to 20 minutes for dark or nonstick pan) or until toothpick inserted in centre comes out clean. Remove from pan to cooling rack. Repeat with remaining baking cups and batter. Cool cupcakes completely, about 15 minutes. 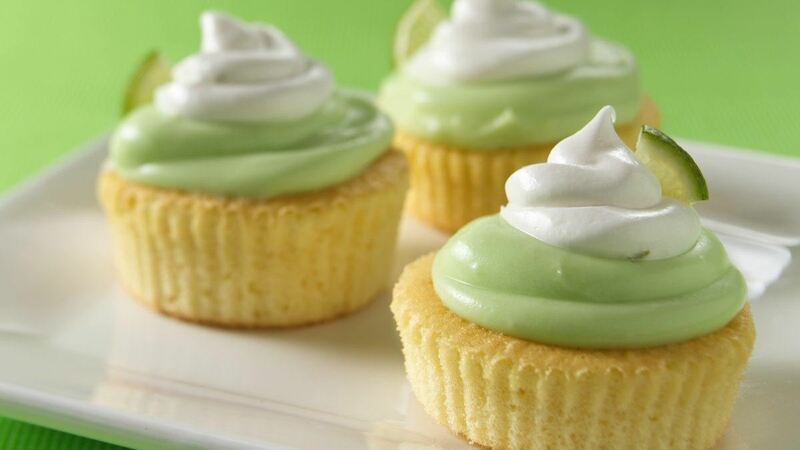 Remove paper baking cups from cupcakes. Swirl about 2 teaspoons topping on top of each cupcake. Stir frosting in container 20 times. Gently stir in 1 tablespoon Key lime juice and the lime peel. Spoon frosting into 1-quart resealable food-storage plastic bag. Cut 1/2-inch opening from bottom corner of bag. Squeeze 1 rounded teaspoonful frosting from bag onto topping. Garnish with fresh lime wedge, if desired. Store in refrigerator. Tip: Check your market for seasonal fresh Key limes in bags, and juice them. Key limes are smaller than regular Persian limes, about the size of a golf ball. You will need 5 Key limes to make about 1/3 cup juice.